Facebook may be stepping up its telecommunications game with a "Phone" mobile app - which was accidentally leaked to Android users last week. Social media giant Facebook might have an even greater smartphone presence with an app called "Phone", as Android customers recently discovered. Last Friday, several Facebook for Android users received an invite to "Try Phone [FB-only]", with all links heading to blank pages. Now that the invite has disappeared, it's suspected that someone at Facebook hit the wrong switch and revealed the Phone app too early - prompting suggestions that Facebook wants to be a bigger part of your daily communications. A lot of the conversation around Phone is speculation at this point - at least until Facebook offers an official statement. At a base level, screenshots advertise Phone as a simple dialer, or "a new app that shows info about who's calling and automatically blocks calls from commonly blocked numbers". That's fairly similar to the Whitepages Caller ID app, but the Facebook connection implies a host of additional features. For example, Phone could potentially use Facebook data to display a callers social media info, giving you a better idea of who's reaching you. 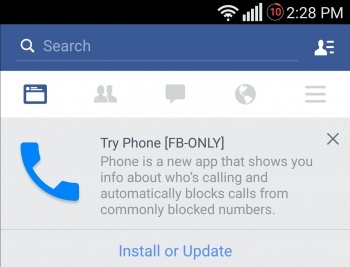 It could also block callers from your own Facebook block lists. The real question is how much Phone will coordinate with your mobile carrier voice network, which would give Facebook a much greater connection to your day-to-day communications. As it stands, Facebook is hosting the F8 Developer's Conference in San Francisco this week - meaning we could have an official announcement by Wednesday or Thursday.